Mark 1:3 in connection with the surrounding verses implies that Jesus is the one being referred to in the prophecy of this part of "Mark". The related prophecy from The Jewish Bible refers to God. The Hebrew uses two different words to refer to God here, the English "God" and "Lord". The Hebrew word for "Lord" is ambiguous as to an English meaning of "God" but the Hebrew word used here for "God" is unambiguous. Therefore, both Hebrew words in the context of the Hebrew prophecy refer to the English "God". Mark 1:3 only quotes the Hebrew "Lord" word to avoid the unambiguous meaning of "God" from The Jewish Bible here. "The voice of one that crieth, Prepare ye in the wilderness the way of Jehovah; make level in the desert a highway for our God." The underlying Hebrew word for Jehovah, "יְהֹוָה ", (Lord), has an ambiguous meaning in the Hebrew of either the English "Lord" or "God". The second part of the line though parallels the first and here the underlying Hebrew word is "לֵאלֹהֵֽינוּ " (our God) which has an unambiguous meaning in English of "God". This indicates that the first reference in the line יְהֹוָה also means the English "God". "The voice of one crying in the wilderness, Make ye ready the way of the Lord, Make his paths straight;"
For "Jehovah" (יְהֹוָה) in the Hebrew "Mark" used "Lord" (Κυρίου) in the Greek. Both have an English meaning of "Lord" and are ambiguous in the Hebrew and Greek as to the English meaning of "God". By not also presenting the second part of the prophecy where the English "God" is referred to unambiguously in the Hebrew, "Mark" has an ambiguous meaning which in the Greek could refer to God or not God. The Jewish Bible prophecy being referred to has a subject of God. "Mark" in presenting this prophecy only includes the ambiguous Hebrew word for "God" or "Lord" and does not include the unambiguous Hebrew word for "God". "Mark" than presents supposed prophecy fulfillment in the surrounding verses by using a meaning of "not God". Mark 1:3 presents a supposed quote from Isaiah 40:3. In Isaiah 40:3 though the referred to location, wilderness/desert, is part of the prophecy spoken by the prophet. In Mark 1:3 the wilderness refers to the location of the prophet. Here the location, wilderness/desert, is part of the prophecy. Here the location, wilderness, refers to the prophet. The referred to prophecy in the Jewish Bible by "Mark" identifies the location, wilderness/desert, as part of the prophecy spoken by the prophet. "Mark's" presentation of the prophecy though changes the use of the location to refer to the location of the prophet speaking the prophecy. Mark 1:3, supposedly quoting from Isaiah 40:3, presents Isaiah as referring to a prophet giving a prophecy in the wilderness and giving instructions to make a path for God. Isaiah 40:3 though has a historical context of the Babylonian Exile and return to Israel. In Isaiah, Isaiah is the prophet and the "wilderness" is the journey between Babylon and Israel. The "path for God" is the path for God's people (Israel). 2 Speak ye comfortably to Jerusalem; and cry unto her, that her warfare is accomplished, that her iniquity is pardoned, that she hath received of Jehovah`s hand double for all her sins. In the preceding verses Isaiah explicitly identifies himself as the related prophet and Israel as the beneficiary of the prophecy. 5 and the glory of Jehovah shall be revealed, and all flesh shall see it together; for the mouth of Jehovah hath spoken it. 6 The voice of one saying, Cry. And one said, What shall I cry? All flesh is grass, and all the goodliness thereof is as the flower of the field. 7 The grass withereth, the flower fadeth, because the breath of Jehovah bloweth upon it; surely the people is grass. 9 O thou that tellest good tidings to Zion, get thee up on a high mountain; O thou that tellest good tidings to Jerusalem, lift up thy voice with strength; lift it up, be not afraid; say unto the cities of Judah, Behold, your God! 10 Behold, the Lord Jehovah will come as a mighty one, and his arm will rule for him: Behold, his reward is with him, and his recompense before him. 11 He will feed his flock like a shepherd, he will gather the lambs in his arm, and carry them in his bosom, [and] will gently lead those that have their young. The succeeding verses explicitly show that God will figuratively be the cause of the literal return of the Jews from Babylonian Exile to Israel. This meaning is confirmed by the real history of the Jewish return to Israel from Babylon. Here the location, wilderness, refers to the prophet. The following verses of GMark indicate that John the Baptist is the prophet and predicts that Jesus will be the one traveling through the wilderness. 6 And John was clothed with camel`s hair, and [had] a leathern girdle about his loins, and did eat locusts and wild honey. See comments on John 1:23. JW: Thank God for Bart Ehranncyman who alerts me to this one and forces me to Edit my own Editing thread (I Am as bad as Eusebius!). Bezae and early Latin witness have added "God" to the end of the phrase, "make straight the paths of our God". Since John the Baptist is indicated to be the Speaker Jesus is indicated to be the Lord. Adding "God" at the end Implies/States that the Lord referred to (Jesus) is God. Ehrrancyman gives the Background/Setting here of "Orthodox" arguing around this time that Jesus was God and other Christian sects arguing that Jesus was not God such as the "Adoptionists" and "Separationists". Ehranncyman introduces a Term I have never heard before, "Methodology", to give Weight to his Textual Variation observations. If Motivation and Provenance (Location) can be established than additional weight can be given to the Direction of Textual Change (What was Likely Original). 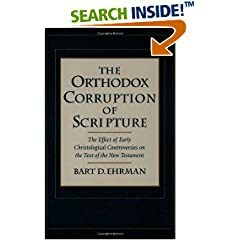 In the Book Ehranncyman limits the Context of Textual Change to known Controversy between "Orthodox" and Non-Orthodox Christianity in the early centuries before Important Christian Doctrine was Defined and Fixed. The entire book than is a Testament that Christian Bible Textual Variation affects Significant Christian Doctrine. Who: "Orthodox Christianity" as a Group. A Few Individual Fathers Identified. What: Important Doctrine. The above illustrates the Doctrine of Jesus being God. When: The early centuries. During and relatively shortly after the related controversies. Why: To support Orthodox views. How: Citation and Preservation of supporting manuscripts as a Group. Undetermined at individual manuscript level. This page was last modified on 6 December 2014, at 14:14.